And who is to say that some of these people DON’T actually have a book inside them? (Well, we are pretty sure the gum-chomping girl at the Abercrombie does not, but then again, this is a real thing in the world.) During the month of November, you can tell those would-be writers, and perhaps yourself, to stop talking about it and really do it. You will be in good company. NaNoWriMo is the acronym for National Novel Writing Month. 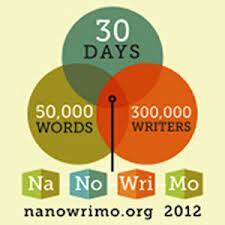 NaNoWriMo is a collaborative effort involving thousands of writers and millions of words. So what are you waiting for? November 1st is already half over… and you still have 50,000 words to go. I will participate in this next year when I’m not enrolled in college !! !